Despite the often-experienced bliss of being here in Costa Rica, the magnetic pull of my life in New York has been acting on me lately, and it feels like everything is falling apart. Yesterday was a blissful day. After my son, Simon, and I did our morning drawings and I dropped him off at camp, I headed for a surf lesson. I returned to my lovely little mountain home overlooking the sea and wrote with happy engagement for several hours. Next, I headed to the farthest edge of Playa Pelada. I went to the little treed alcove by the cliff and began to move in Flowing, without much inspiration. I realized that the sky was cloudy, and that it wasn’t as important as usual to stay in the shade, so I moved out from the shadows—the fringe of the beach—and into closer engagement with the sea. This dance led up to and through the highest point of high tide. Because I have enough experience with the site now, I wasn’t afraid that high tide would pulverize me, and knew where I could safely go. I flowed into an exquisite intersection. There is a sharp little cliff island that the sea has to flow around, so at high tide the waves don’t just travel to the beach and end, instead they curve around the island and into each other, contending on one side with another giant cliff, and on the other with thousands of medium-sized rocks. There was sand space between the two fields, but it would often fill up to a foot deep as the waves dumped into it. There was a tremendous amount of dynamic activity there. Each wave itself was fascinating, but here there were also conjunctions, risings, fallings, eddies, whirlpools, waves created by rock forms, currents hitting, turning and continuing past the cliff, and, further out, the crashings of giant waves and the cascading ribbons of white water over the huge rocks as each wave fell away. This is where I found my dance yesterday. Small flutters of receding water carried me into a swoon as I glanced along the edge. I danced quickly backward, running away from an advancing wave. Waves from the two sides of the cliff crashed and battled and I dipped and turned, catching edges, expanding, contracting. 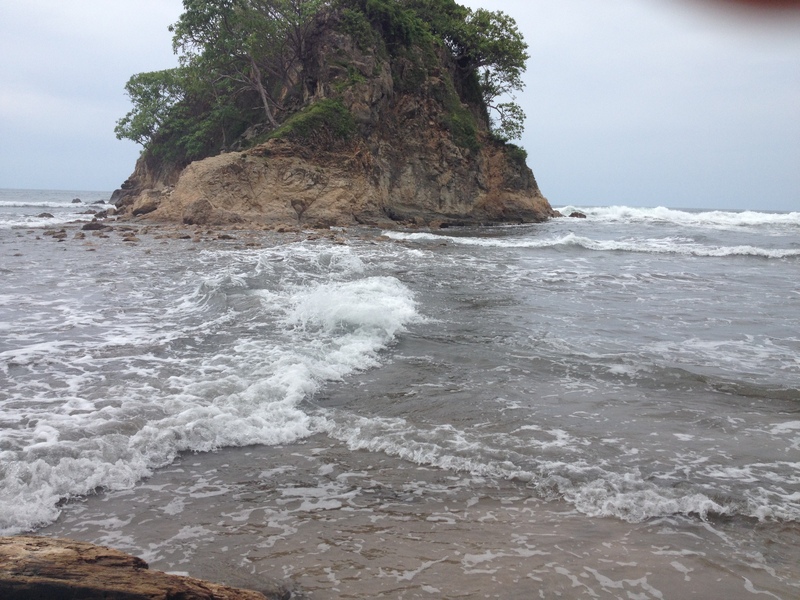 In Chaos, the water rushed to my knees and loose rocks crashed into my feet as I danced through the breaking waves. I have been deliberately vague about the theme I am exploring within visual art during my stay in Costa Rica. I don’t want to give it all away here, but I will share a small piece, since it is important if there is any hope of you understanding why this dance was so touching for me. The theme I have been exploring is “Everything is Perfect.” I don’t mean this in a repressed, let’s-pretend-we-are-not-vulnerable-or-flawed sense, but rather from the perspective of Tibetan Vajrayana (Tantric) Buddhism that we already have absolutely everything we need to “wake up”, exactly as things manifest in this moment. The conditions for our enlightenment are always perfect. We are not trying to be holy, we are not trying to get somewhere else—instead we are working with the exact material that we have on hand—be it debt, anxiety, unresolved relationships, a beautiful sunset, mild fear of poisonous animals, exquisite florae, problems with your landlord in Costa Rica, the kind gestures of a tender-hearted five-year-old, difficulties with a roommate, or whatever. The phrase “Everything is Perfect” was whispered to me at a Tibetan Buddhist temple at a moment when my life felt like an untenable disaster. I danced then, sobbing, gazing at sunset over the Hudson River as I took in this important lesson, that things are exactly correct, just as they are, no matter how unpleasant or messy. What would it be like if we, ourselves, were Buddhas? Would we still get jet lag? Take out garbage? Lose car keys? Sometimes I play a game with myself and imagine how I might experience things if I were a Buddha. I am pretty sure I wouldn’t be just sitting around all day with half-closed eyes and a mysterious smile, but that I would be engaging fully with the events that arise in my experience. As I have been making visual art, meditating, dancing and moving, I have been contemplating “Everything is Perfect”. Yesterday, as I partnered with the waves, I started to sing the chorus from the 1960’s ballad with the lyrics, “Take good care of my baby. Be just as kind as you can be.” Flowing had much to offer me, and I stayed in this foundational rhythm for a very long time. The receding waves pulled me, new waves pushed me, various conjunctions spun and tilted me. And throughout I hummed the refrain, “Take good care of my baby.” As Flowing danced me, I started to sob. I realized that the message was kindness. If everything is perfect, there is no need to try to force anything into a different mold, no need to insist on anything, no need to resist whatever arises in your experience. You can simply be kind. Tenderness melted me and as I sobbed I witnessed each event with gratitude as the waves took form and disappeared. Interacting with these elemental forces humbled me and broke my heart. I thought about the times I have been mean, tight or unkind with my son—usually wishing for things to be a certain way, for him to act a certain way, for time to bend to my will; and I cried and cried for all of the minutes I have lost with him and for all the times I could have been kinder. In dance, I sobbed, asking forgiveness, prostrating, bending back and forward, offering my heart with my hands. I danced a full wave at the beginning of this dance, but Flowing pulled me into it again and again. After a while, I let go of the frame of the rhythms—not letting them dwindle, but instead letting them collide—and continued to move with creativity and wholeheartedness. A few people came walking by. I barely registered them—not wanting to show off or to hide in any way. Lyrical brought me to the sky. Stillness, when it finally came, found me again sobbing, porous. The waves passed right through me, even passing through a tightly held spot in my diaphragm that I rarely release. I moved un-self-consciously, crouching to observe rippling, golden sunlight on a little pool of water, the wind moving and directing me as I slowly shifted positions, the waves arising and receding again, revealing the sand between. Gabrielle Roth, the creator of the 5Rhythms, was absolutely right. She often said, “A body in motion will heal itself.” She believed resolutely that if we could only move we could each find our path to freedom. The journey of my dances in these short two weeks has strengthened my faith in Gabrielle’s position; and I feel even more committed to practice, even if I feel lethargic or uninspired. In the afternoon, after dancing my heart out, I picked Simon up at camp. We took a break at home before heading to the beach. He watched Spanish-language cartoons, and I worked on red tape. After awhile, I switched to make some notes about my dance. Simon wanted attention as soon as I began this activity. He kept asking questions, having new needs. I said sharply, “Simon! I need to do this right now. I need just a few minutes. Please leave me alone!” He responded, “That’s mean, Mommy!” It is amazing how quickly I forgot the lesson of just a few hours before, the aspect of “Everything is Perfect” that has to do with acceptance and kindness. Today was not a blissful day. It was riddled with afflictive emotions: anxiety, discomfort, anger and sadness. For one, I decided to move out of our current lodging to try for something better, though I wasn’t able to get a refund on the original place. I regretted my decision almost immediately, and we wound up in a place with no view and with nowhere beautiful to sit and write. Although I wasn’t thrilled about the place when we were there, I missed the family very much, and found a lot of sadness once I started to dance. Now, I am considering even a third move. Part of me just can’t get settled, thinking there is something different somewhere else that will be better, somehow, than my current conditions. Sometimes when I enter a dance with afflictive emotions, I end the dance with the very same set of afflictive emotions. Today, however, when I went to dance with the colliding high tide waves, I found tenderness and emotional depth instead of afflictive emotions. Though there was not as much cloud cover as there was yesterday, I again left the shadows and stepped into the dynamic matrix of high tide forces that I found yesterday at Playa Pelada. The constantly changing ocean waves carried me through another exquisite dancing wave. Again, I stayed in Flowing for a long time, being pulled and repelled by the sea’s shifting forces. I moved with my eyes raised and alight, attending to the horizon and to the many elemental forces that moved and held me.